Mid-summer is upon us and and this is about the time when I need a serious shake up when it comes to my daily salads. I adore the produce of the season, but it can get monotonous if I’m not careful, which is where grilling your salads can save the day. Grilling salad (or more specifically: lettuce) sounds like a crazy idea, but it’s actually an awesome way to turn up the flavor on your basic salad. By grilling your lettuce (in this case romaine) and other toppings you add a great charred flavor and introduce a new texture to your salad bowl. When you are choosing your lettuce for grilling, look for tight heads of lettuce. 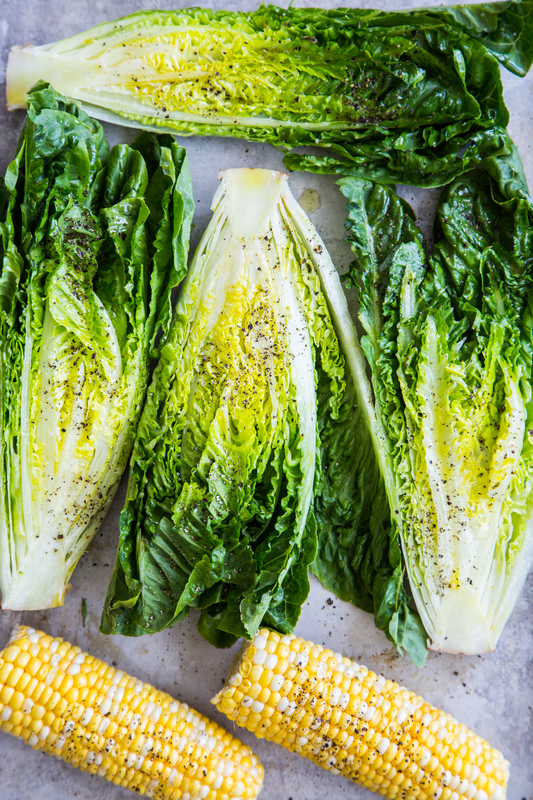 A head of lettuce with lots of floppy, loose leaves can be unwieldy when trying to grill, plus the stray leaves tend to catch on fire when grilling. To prepare your lettuce for grilling, cut the heads in half lengthwise through the root end. Keeping the roots attached will hold the leaves together making it easier to transfer the lettuce on and off the grill with ease. Brush the cut sides of the lettuce with olive or avocado oil and sprinkle with salt and pepper. I like to keep my grill at about a medium low, as the lettuce grills quickly. Start by placing the lettuce cut-side-down on the grill for about 2-3 minutes. This is not a recipe where you want to walk away from the grill. Watch your lettuce carefully to ensure that it’s not going up in flames or wilting too quickly. When the lettuce looks like it’s changing color slightly and beginning to soften, flip it over and grill from another minute or two on the other side. The lettuce should be slightly charred and wilted, but still have some crunch to it. Grilled salads are automatically flavorful and don’t need a lot to finish them off. I added some grilled sweet corn, fresh tomatoes, and a quick and simple cilantro vinaigrette. For greens and lettuces that grow in round heads such as the endive and Savoy, cut the heads in quarters (or eighths if heads are large) keeping the root end in tact for easy grilling. These tougher greens will take a little more time to grill than a more tender lettuce so be sure to keep on eye out for signs that they are finished cooking. Kale leaves can be brushed with oil and placed on the grill individually. Endive heads can be treated like miniature Romaine hearts and will grill very quickly. So, for the next time you are looking to turn up the volume on your salad, try throwing it on the grill for some quick and easy flavor! 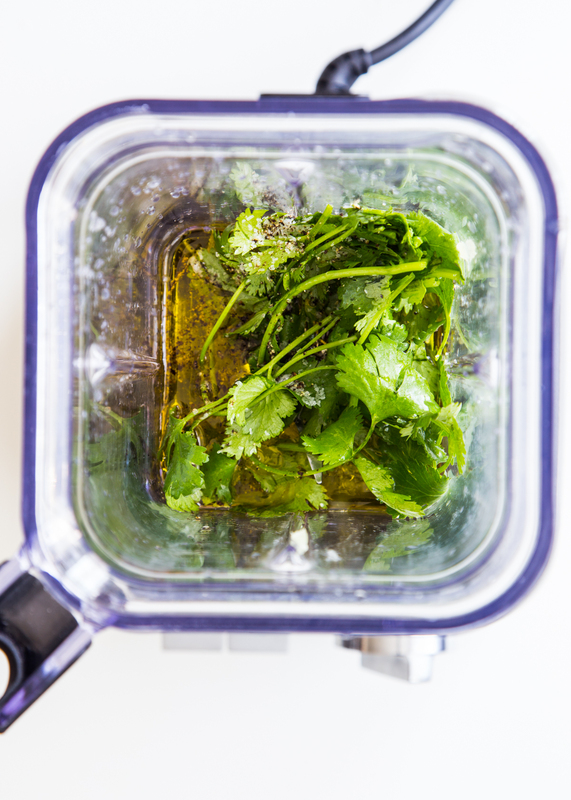 In a blender, combine 1/4 cup extra virgin olive oil, 1/4 cup white wine vinegar, cilantro leaves, lime juice, and salt and pepper taste. 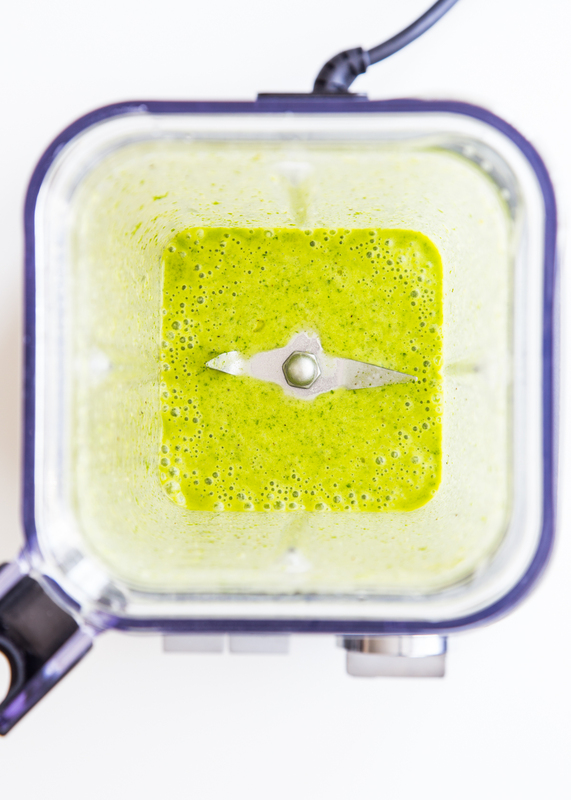 Blend until smooth and emulsified. Set aside. Cut heads of romaine lettuce in half lengthwise through the root end. Keep root attached for easier grilling. Brush cut sides of lettuce and ears of corn with remaining olive oil. Season with salt and pepper. 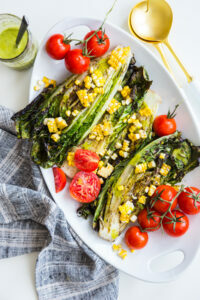 Grill lettuce and corn on medium-low heat for 3-5 minutes flipping once or until lettuce is slightly charred and wilted but not soggy and corn is tender. Remove from the grill. Cut kernels from cobs. 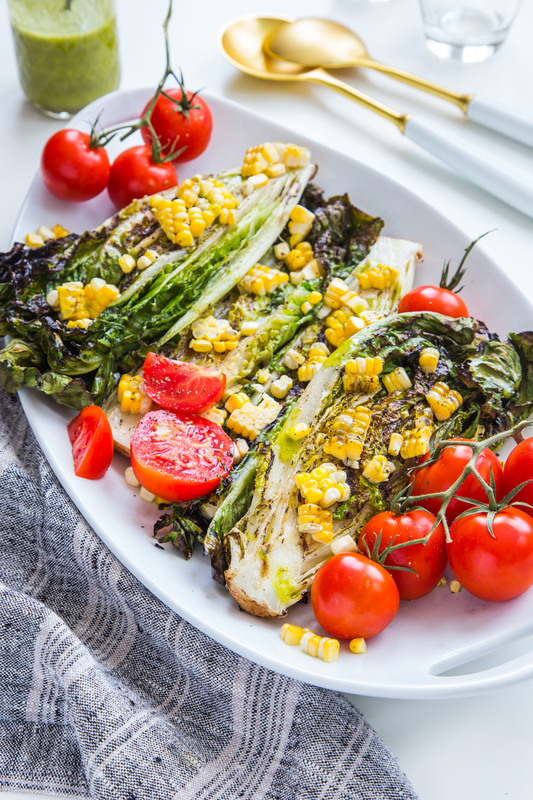 Arrange grilled lettuce on four plates and divide grilled corn and tomatoes amongst the salads. Drizzle with dressing and serve immediately.